World War One – How did the Eastern Front differ from the Western Front? The Eastern Front in World War One is often largely unknown to many Westerners. The situation there was quite different to that on the Western Front. Here, Rebecca Fachner follows up on her articles on Royal Family squabbles here and the spark that caused war to break out here. The 100th anniversary of the first summer of World War One rolls onward, and with it commemorations of battles that everyone in the Western world seems to know instinctively - the Marne, the Somme, Ypres… The war on the Western Front is very much alive in the Western consciousness, but what is so often forgotten is that it was actually a two-front war in Europe. Germany was not only fighting in the West against the French and British (and eventually the Americans), but also in the East against the Russian Empire. 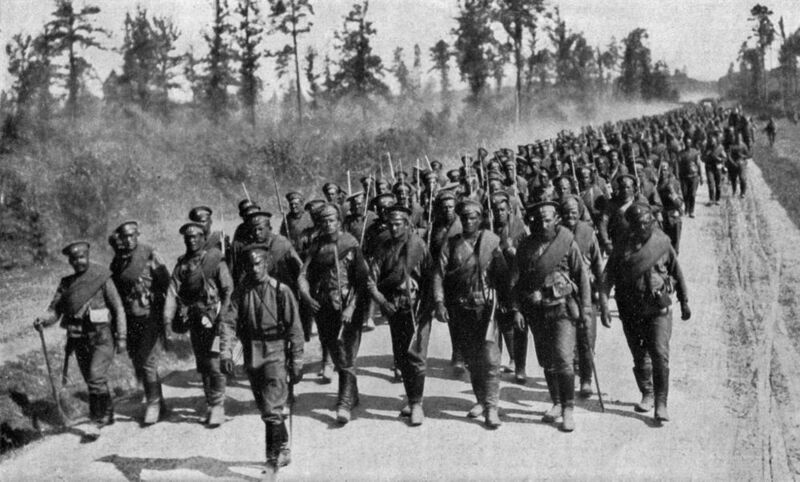 Russian troops on the move to the front line. From National Geographic magazine, volume 31. 1917. As a fighting force, the Russian Empire was extremely contradictory. They were a formidable foe, but at the same time a very worrying ally. Their one huge advantage in warfare was the sheer numbers of troops that they had at their disposal. It was truly a staggering amount of men, millions upon millions of Russian troops, a “mass of bodies ready to bleed” in the words of one historian of the period. The main disadvantage for the Russians was everything else. The army had miserably poor leadership, was woefully underfunded and was technologically backward. In the years before the war, the Allies, especially France, had spent enormous sums of money trying to improve Russia’s technological capability. Railroads had been a particular target, as the movement of troops to the front as quickly as possible was of paramount importance. France knew that German war plans hinged on Russia’s inability to mobilize their troops and so planned on attacking France first, then moving on to Russia only after the French had been defeated. Therefore, if Russia could respond more quickly, and force Germany to divert troops in their direction earlier, so much the better for France. Their efforts did do some good, but not enough, as was painfully demonstrated in the opening days of the war. It took weeks for the Russians to assemble a fighting force along the German and Austro-Hungarian borders. Russia began the war by invading eastern Germany. It was able to do so as Poland was not an independent country at this time meaning that Russia and Germany were contiguous. The first major engagement of the war was the Battle of Tannenberg, which was a resounding defeat for the Russians. The next week at the Battle of Masurian Lakes, the Russians were pushed back further, and would not fight on German soil for the remainder of the war. Despite the inauspicious beginnings, the Russians did enjoy some success, particularly against Austria-Hungary in the fall of 1914. By 1915, however, the Germans had made the Eastern Front their top priority and began to hurl troops at the Russians, managing to turn the tide of the eastern war permanently in their own favor. Russia never again enjoyed a significant advantage. The geography of the war in the east was very different when compared to the west. Rather than a compressed front line, the Russians and Germans were eventually fighting over an area of more than a thousand miles. This spread the fighting, placing a much larger burden on military supply chains than in the west, and making Russian transportation problems an even bigger issue as they began to have supply problems soon after war broke out. One small, seemingly trivial problem added to the frustration, namely that Russian railroads were, and still are, on a different track gauge than parts of Europe further west. Railroad tracks in Europe (and almost everywhere else) are 4 feet 8 inches apart from each other, but in Russia the tracks are 5 feet apart. This means that trains from Europe don’t work in Russia and vice versa; to this day, if you are travelling by railroad into Russia it causes delays at the border. This created all kinds of chaos for supplying both armies and moving troops. All told, it generally slowed down the war in the east. Additionally, because the front line stretched over so large a territory, trench warfare, something that is so closely associated with the war in the west, was not a factor in the east. There was no need for trenches, as the armies had so much more room to maneuver. Another significant and often remarked upon problem for the Russians was the personality of the men making the key decisions. Tsar Nicholas was a weak and largely ineffective leader, and enjoyed far too much command authority for a person with limited military experience. His two top commanders, Grand Duke Nicholas and Minister of War General Sukhomlinov, hated each other and constantly tried to undermine the other, often to the detriment of their command. One of those commanders, it must be said, Grand Duke Nicholas Nicholaievich, was an extremely dedicated and able military commander, frustrated by the duplicity of his counterpart and the ineptitude of his boss. This was not a recipe for success, and as the Russians continued to lose, blame was shifted around and around the command structure. Eventually the Tsar, frustrated and exasperated, decided to move to army headquarters to take personal command of the military. He hoped that his presence would inspire both the troops and the command structure and turn the tide of the war. On the face of it, this was not as poor a decision as it turned out to be, and at least the Tsar’s heart was in the right place, so to speak. Unfortunately, Nicholas’ presence had the opposite effect, and he was blamed by many for every single thing that went wrong with the war from that point on. This severely undermined his authority, not just with his army but also with his people, who had previously believed that the Tsar was close to divine, and blamed all the military failures on his generals. With his very visible presence at the head of his army, Nicholas was exposed as ineffective and weak, and the Russian people had no choice but to blame him for the manifest failures of his strategy. Compounding the Tsar’s image problem was that he had left his wife in control in his absence. Empress Alexandra was dangerously unstable, and extremely unpopular, partly due to her association with the monk Rasputin; it was widely thought that she was under his direct control. Alexandra quickly assumed many of the governmental duties that her husband had left behind, which was very unfortunate, as she had little political acumen and no experience in government. What she did have was an unshakable faith in Rasputin, and a stubborn refusal to grasp how widely he was mistrusted and disliked. Alexandra careened from one disastrous policy to another, dismissing competent ministers and replacing them with self-serving yes men. Events continued to spiral out of control, and after years of war and shortages, poor management and an ineffective monarchy, it is actually extraordinary that the revolution didn’t happen sooner. The Russian Revolution, at least the first one, didn’t end the war. The first Russian Revolution, in February 1917, deposed the Tsar but the Provisional Government that took his place did not want to end the war. Alexsandr Kerensky, the leader of the Provisional Government, had the makings of a political genius, and it is one of the frustrating what-ifs of the Russian Revolution to wonder what he might have achieved, but he was intent on continuing to prosecute the war. This proved to be the undoing of both the Provisional Government and Kerensky, as they underestimated just how war weary Russia was, and suffered the consequences when the Bolsheviks launched the October Revolution, promising, among other things, to end the war. The Bolsheviks sued for peace, and the Germans forced them to sign a humiliating treaty, ending the war in the east. A clip about the 1916 Battle of Lake Narocz on the Eastern Front is available here on the site.